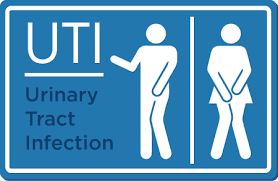 UTI means Urinary Tract Infection. It’s the second most common infectious disease. It’s a painful Disease and people go to doctor chamber for quick relief. Every year more than 8.3 million people visit doctor’s chamber due to urinary tract infection. It can attack both male and female. But usually female are more sufferer then male.UTI is a bacterial infection which is usually caused by E.coli bacteria. E.coli is a gram positive bacterium which usually present in GIT. Each year a huge amount of money is spent behind it. But you can save this money by following some easy but very effective home remedies. UTI home remedies will work when you really facing UTI. So make sure that you are a UTI patient. There are some common symptoms which will help you to diagnosis UTI. There will be a burning sensation after urinate and you will face itching. You have to go wash room frequently but the volume of urine will be very small amount. Your urine color may turn into cloudy. Sometimes you will face pelvic pain. Most effective home remedies for UTI. Eat plenty of water. Water will increase your urine volume and it will help to flash out bacteria which cause UTI. Drink at least 4 liters water in a day. Try to drink a glass of water before going to bed at night and just after wake up in the morning. It’s a very effective home remedies which will inhibit the spreading of urinary tract infection. It’s very helpful for quick pain relief. First add one teaspoon of baking soda into a glass of cold water and mix it properly. You can consume this mixture even after recovery from the UTI for future protection. Bromelain is an enzyme which has strong anti-inflammatory power. This bromelain is found in pineapple. Try to eat one cup of fresh pineapple daily. Don’t eat preservative containing pineapple juice. fresh juice helps a lot in urinary tract infection. You can try blueberry, berry, and lemon juice. Lemon juice has anti oxidant property that will help a lot in UTI. You can also drink Coconut water and carrot juice. Someone said that it is an expert’s home remedy. We know potassium has the ability to prevent growth of bacteria which causes UTI. This potassium rich source is apple cider vinegar. It will surely help you a lot in UTI by inhibit the multiplying of the micro-organism. First take two teaspoon of apple cider vinegar and one teaspoon of honey and mix it with a glass of drinking water, now mix it properly. Drink this mixture twice daily for quick relief from UTI. Vitamin C is a water soluble vitamin. It has anti oxidant capacity. It makes our urinary bladder healthy. In UTI it will suppress the growth of micro-organism. So try to eat vitamin C containing foods like orange, lemon, guava, blackberry, water melon, tomato, raspberry, pineapple etc. You can also get supported from vitamin C contain tablet. When you feel pain in lower abdomen just apply a hot water bottle ion that area. It will minimize your pain by decreasing bladder pressure. It will also inhibit the spread of the infection. You can also use heating pad on lower abdomen for pain relief. Tea tree oil has strong anti-bacterial property. It fights against bacteria that cause UTI. It’s very easy to use. First mix ten drops of tea tree oil with your bath water. Then simply wash urethral opening gently by it. You can also use tea tree oil by making a mixture by equal amount of tea tree oil, juniper oil and sandalwood oil. Now gently rub your lower abdomen by this mixture. Follow this method at least four days for getting a good result. It has got antiseptic property and very useful in treating Urinary tract infection. It is available your near drugstore as a supplementary forms. It will kill the bacteria and helps you to get rid of UTI. But a important things you have to remember and that is it is contra indicated in liver disease, kidney disease, pregnant women, nursing mother and children. If you follow these above mentioned home remedies then surely you will benefit a lot. If you face any kind of allergic reaction by using those remedies then stop using them immediately. I hope this article will help you and that’s my only hope. Thanks for reading.